Cloud storage free trial 60 days, please contact us to activate. If you have any problems (like Return, Connection, Firmware Upgraded, Cloud Service...), PLEASE use the App online customer service, or send to aaron@elinksmart.com, or send message in Amazon system. We will reply in 24 hours. Before buying, you can experience the test account on the "eSmartCam" App, account and password are "elinksmart", the test account only open partial functions. Useful home security wifi camera, eLinkSmart IP camera is designed to serve as a supplement to existing residential and business security systems. 2) Record, store and review video and picture using a TF card and can be edited, deleted or shared directly from your mobile phone. 3) Reset button is behind the wifi camera. Press 5 seconds and it can be recovered to factory default. 4) Work on 2.4G WiFi, some of the functions require you to open permissions in the phone settings. ✔ Multi-Picture & Sharing: Crystal 1280x960 High Definition picture,configurable picture ensures a sharp high quality image to optimize gadgets for smooth play back, one app support multiple wifi cameras connection and 4 cameras split-screen viewing, Cameras can be shared to your family's App account, need he download and register the App on his phone. 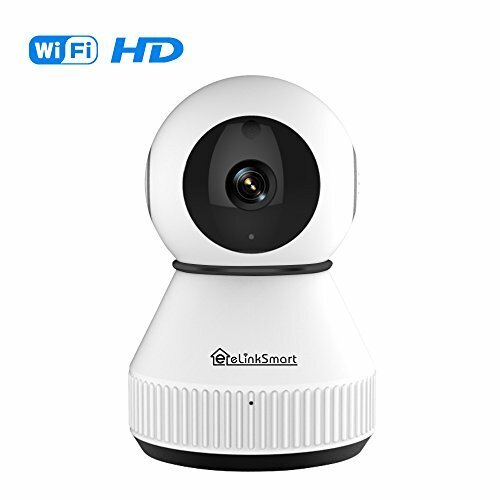 ✔ Night Vision & Recording: Automatic switching to night vision mode, Night vision distance up to 20 feet, high definition real-time monitoring, videos can be recorded to a Memory card (support 128G), you can view the playback on phone. Cloud storage free trial 60 days, please contact us to activate. ✔ Two-Way Audio & Active Call: The Wifi IP Camera built in high quality microphone and speaker, support two-way talk, if your family needs to contact you, just press the button behind the IP camera, it will call to your cell phone. ✔ Motion Detection & Alarm: The IP Camera can detect moving things or cry voice, and push alert notifications and snapshots to your smartphone. You can adjust the frequency of reception notifications by adjusting the sensitivity. ✔ Fast Connect & Privacy Protection: Quick WiFi setup via mobile App on iPhone or Android smartphone, reboot after power failure no need to reset. If connection is successful, pleas click Pan/Tilt rotate to remote control and use two fingers slide outward or slide inward to zoom. Point to point communication, videos wont be saved on any servers or forwarded by manufacturer, your phone direct connect with the camera. Manufacturer: Shenzhen Elink Smart Co., Ltd. Publisher: Shenzhen Elink Smart Co., Ltd. Studio: Shenzhen Elink Smart Co., Ltd. If you have any questions about this product by eLinkSmart, contact us by completing and submitting the form below. If you are looking for a specif part number, please include it with your message.